The Hypothetical Development Organization was set up in 2010 in New Orleans and I have been keenly following the progress of the group since I discovered them last year. The company aims to find “hidden gems”, mostly derelict or unused buildings within their neighbourhoods and then sets about in coming up with a conceptual proposal for the space. The organization then produces renders of the proposal and pins them up on the building. By this form of guerilla advertising of the hypothetical it highlights the potential of buildings in the hope that developers will take the hint and make the most of the space. 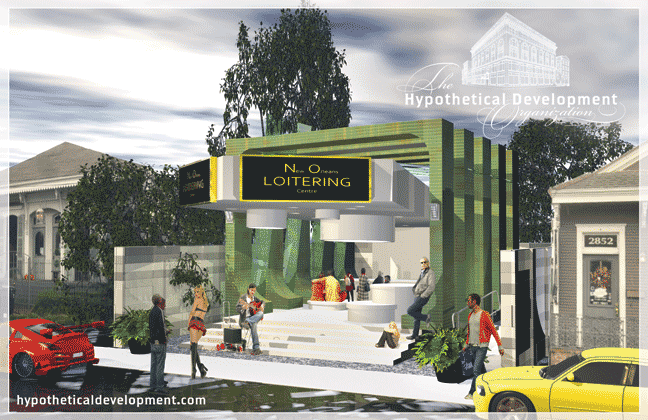 This is my favourite of the recent proposals, The New Orleans Loitering Centre. It turns its back on the common ‘No Loitering’ policy in place in many urban environments. For me the idea is great, particularly in sunnier climates I can see this idea being a brilliant social, meeting space for strangers and friends. Now if only someone would actually build it! The centre would certainly be a vast improvement on the current building, pictured above. More information on The Hypothetical Development Company and the individual projects is available on their website.